I wanted to share with you the best $ 9.98 I have spent in a long time. I guess that isn’t true, I have now bought 4 of these books so I guess it has cost me $40.00…. still well worth it. I was at Barnes & Noble with my daughter and picked up this book in the front of the store. I looked up my daughter’s birthday. My daughter said, “I don’t believe in any of that stuff.” I read the first 2 sentences about her (which was dead on) and bought the book. 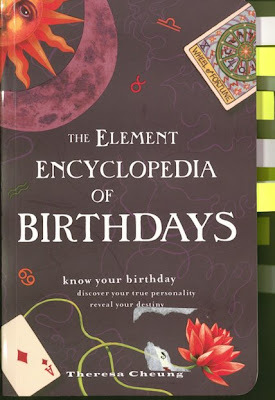 I have taken the book to 2 birthday parties since then and we have had great fun reading about each other. In fact the scan of the book above still has all the post it notes in it for the birthdays of the moda gals. 1 of the 4 books I have bought is now owned by my daughter who doesn’t believe in this stuff. I guess I don’t believe in it either but the good, bad and the ugly of my birthdate was so correct it was creepy. Theresa Cheung is the author and I have now seen a bunch of other cool stuff that she does. I will have to check out to see if I can find some more mindless entertainment. Sounds like a very interesting book Lisa. Dont you like when the kids dont believe in it then…..they want it. Now I’m itching to know what it says for my birthday. Love that kind of stuff. I took the Martha quiz, but I think it was flawed. On the 3rd question, “You’ve been trying to eat healthy and are at a party where the host’s famous fudge is on the dessert buffet. Are you able to resist?”, it gave no option/answer D for me…. “I come to parties with Tupperware”. As soon as I got home Friday after you reading my birthday, I ordered the book online from Barnesandnoble.com. Should be getting this early this week… can’t wait! Okay, I bit. I just ordered it. Oh, and you know we are all going crazy trying to enlarge your family photo. It’s just a little bit too small to see all your handsome children. Oh fun! I love it when they're creepily dead-on! So you can look up 8/4/65 and it'll tell you all about how I am! ;o) I'll have to stop by B&N and check it out! I know one person that has exactly the same birthday as me, year and all and the number of times that we’ve said “me too” when talking about our approach to things is very strange…so perhaps there is something to it. I don’t know if I believe in it either, but I think it’s fascinating. I think I’ll have a look and see if I can find a copy of this (just out of curiosity, you know). Thanks for the heads up, this book sounds like fun. Just thought I would clarify that! Did you get my email with answers to your questions??? I did answer that day so I’m hoping that you got it.